If managing your Outlook email content is important to your work, then MessageExport is a tool that can save you a great deal of time and effort. 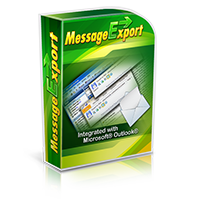 MessageExport is an add-in for Microsoft Outlook (2016/2013/2010/2007) that greatly expands your ability to save and convert your email messages. For more than six years, MessageExport has been an important tool for people who need to manage email content, simplifying the process of converting and copying email messages from MS Outlook to neutral formats such as .pdf, .eml, .mbox, .csv, and more. With MessageExport, you can convert Outlook emails to different formats either in bulk or individually, and simultaneously perform additional functions, such as compressing the output into a zip file, or copying the output to a specific folder. MessageExport uses "export profiles" which are selected from a drop down list in the MessageExport's Outlook toolbar. Export profiles are instruction sets that give you a lot of flexibility to determine how MessageExport operates. MessageExport comes with about twenty pre-configured export profiles, such as, "Export to PDF - attachments converted/included." You can customize profiles, or create entirely new ones. To use MessageExport, start by selecting the Outlook email messages you want to convert from the email list. Once the messages are highlighted, choose the desired export profile from the toolbar dropdown list. Click the export button to begin the process. The image below shows the entire process, from selecting Outlook emails, choosing an export profile, and starting the process. MessageExport can also convert an entire Outlook folder, making it a great tool to use along side Outlook's Rules function. For example, if you want to convert all emails received from a specific email domain into a pdf format and copy it to a shared folder, this can be accomplished quite easily with MessageExport. There are endless ways in which MessageExport's capabilities can be combined in an Export Profile to automate manual email conversion processes. Create specific naming criteria (bates-stamp like) and apply to the file name. The best way to learn about MessageExport is to download a 15 day free trial and try it for yourself.